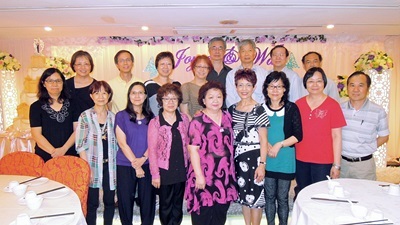 It was a great pleasure to see so many classmates attending the dinner on May 15, 2013, and I particularly want to thank Adrian Hung for arranging this warm and enjoyable reunion for me. When Adrian requested me to write something (about 500 words) to post in the blog, I immediately felt like I was back in secondary school and was being asked to write a composition. I assume everyone must well remember that writing a composition was a headache, so I decided to simply start it with what had happened to myself since graduation because I feel I am obliged to tell my story to the classmates. After I graduated from Confucian Tai Shing Secondary School, I had also completed a two-year matriculation but I was unable to attend further studies in Hong Kong because I immediately obtained a job with decent pay to work for an American company in Prince’s Building at that time. It was a marine insurance business and I was under the training of an English Average Adjuster. 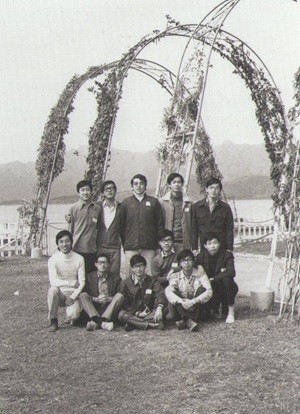 During the mid-year of 1975, my parents migrated to the United States but I was unable to join the family because the U.S. immigrant quota for Hong Kong citizens per year was limited which also had to be shared with other Commonwealth Countries. When I arrived in the U.S. in November 1980, I first landed in Minneapolis, Minnesota, which is in the Midwest. Minnesota is called the State with 10,000 lakes, and no doubt, Minneapolis is pretty, quiet, people with slow pace, and as known by its name, you can even find many lakes in the metropolitan area. After enjoying a little more than a year of fantastic life in Minneapolis, I decided to move from this inland State to New York for a better career. I was lucky enough to rejoin the same American firm which I worked for in Hong Kong. Since then, I have stayed in the same career as an Average Adjuster in the marine insurance field for all these years. I came back to Hong Kong numerous times both for pleasure and business because my Company had clients here. I want to tell everyone that each time when I was in Hong Kong, I went back to visit Tai Shing Street. I took video and pictures there and with a hope that I could bump into one of my classmates on the street who still lives in the neighbourhood. I take this opportunity to thank my sister who forwarded me Tai Shing’s website and through visiting this website, I was able to contact and reunite with my old high school classmates. The dinner on May 15, 2013 was a warm and enjoyable one and I was surprised that I could still recognize most of the classmates there which I miss for 42 years. I was also happy to see Ms Ho Po Yuen at the dinner because I was told by other classmates that this was the first time she showed up at the gathering. In my memory, Po Yuen was a quiet and shy person. I did not talk to her too much that night but it appeared to me that she was not as shy as when she was at school. I was also impressed by other female classmates who showed up at the dinner. They are very active and sociable. Unlike in the old school days, I remember that it was hard for the girls to talk and get together with the boys. Am I right on this? I am glad to see that everyone looked great at the dinner – healthy, bright and with smiling faces. I wish everybody stays with these characters all the time as these are the essential elements we need in order to achieve longevity and happy lives. I have deep sorrow to learn that we have lost three classmates and I want to send my condolences to their families. This blog message is getting too long and boring so I decide to end it here. As my retirement is approaching, I wish we can keep closely in touch with each other and if time allows, I will try to participate in all your future activities. I also wish that the search for the other missing classmates by the committee members will eventually be successful. The weather was fine on the 13th of April, 2013 but it was cloudy in the morning. However there was sunshine in the afternoon. It was a bit warm and was perfect for outing. 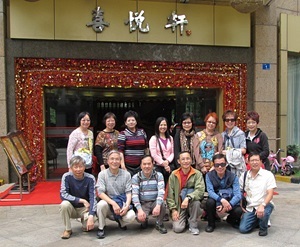 Siu sir invited us for a Shenzhen tour a couple of months ago. There were a dozen of classmates together with some of their spouses joining the tour. We were glad that Simon Fan from Melbourne and Peggy Wong from Toronto made special trips thousands of miles away to join our tour. It is amazing that our cohesive power is so strong that our classmates were attracted to have a beautiful day together. We gathered at 9:30 a.m. at Futian Checkpoint at Shenzhen with Siu sir waiting for us. Siu sir was our tour guide and David Yeung was our tour leader. We settled down in a Chinese restaurant and had our dim sum morning tea there. The food was in good quality and relatively cheaper than Hong Kong. After morning tea, we took the MTR to Lotus Hill. The weather was a bit cloudy. We took a leisure walk to the peak of the hill. Some classmates felt tired in walking up the hill. They might need some more exercises! 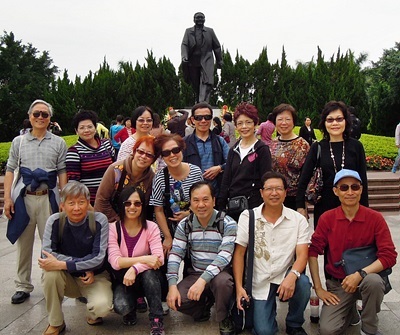 We took photos in front of the statue of Deng Xiaoping (鄧小平). 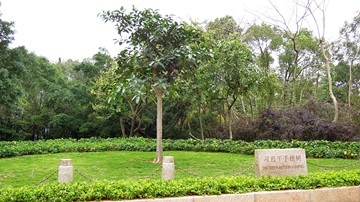 The economic development of China started in Shenzhen under the directions of Deng. Shenzhen was a village 30 years ago. Now it is the fourth largest city in China with a population of 15 million and GDP of around RMB 1 trillion. It is really unbelievable for such a huge development to have been made in a short period of just 30 years. The scenery in Lotus Hill was really attractive and there were a lot of people enjoying themselves. Some people flew kites and a few people sang songs and played music for fun or for money. We found a place at the foot of the hill where single people put up notices there hoping to find their suitable life partners. We arrived at a fishing pond and saw a man catch a big fish weighting a few kilos. We had afternoon tea in a cafe in a shopping centre. Some of us were rather tired and therefore they took a break to recover their strength. A few of us went shopping and bought CD’s, books, etc. Siu sir and David went to pick up Lee Shin at the MTR station. Shin finished his work in the morning and rushed to join us. After finishing our afternoon tea, we took the MTR to another shopping mall, Central Walk Shopping Mall. We went shopping at a supermarket. We looked around for some bargains and quality stuff to buy. Simon had to leave us early because of his prior arrangement. It was dinner time – 6:30 p.m. Siu sir led us to a decent good Chinese restaurant near the shopping centre. We ordered some good and delicious food such as Peking duck. We enjoyed the food. We talked about how to find our missing classmates and discussed another tour in December just after the School’s 50th Anniversary Dinner on 7th of December, 2013. We are expecting that there will be some overseas classmates coming to attend the anniversary dinner and it will be a good time to organize a tour for them. It was around 9 p.m. after dinner and we had to return to Hong Kong. Thanks to Siu sir for guiding us in Shenzhen. We had a very enjoyable day. 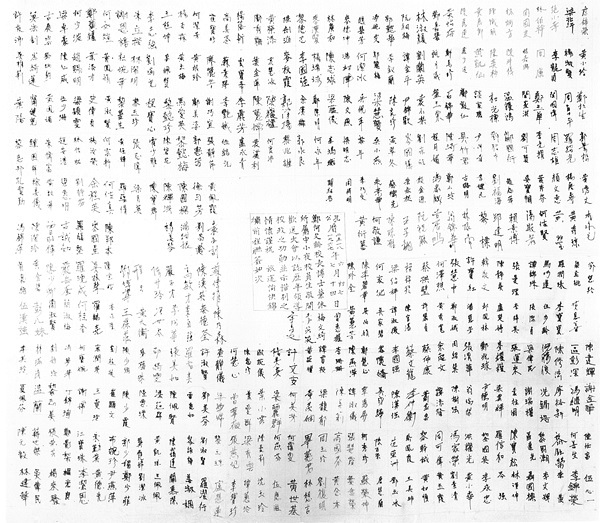 Irene Ko kept a forty-year old classmates contact list. The phone numbers were changed and the number of digits increased from six to eight. This didn’t affect Irene’s idea to use the old phone numbers in which these numbers are traceable. Although the classmates had moved homes, their family members might still be using the old phone numbers. Hence, we could possibly obtain the current contact numbers of our classmates. Irene called the classmates using the old phone numbers. 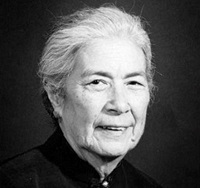 She was excited and found two female classmates’ families, Ms A Ho and Ms B Ho. A never answered Irene’s call. B spoke to Irene a few times. However, B spoke frankly that she didn’t want to reconnect with us since her graduation. Whenever we had gathering, Irene invited B to join us but she kept refusing our invitation. She almost came to our welcome dinner for Johnny Shum on 16th Dec 2012. She said she had sore legs and Adrian Hung offered to pick her up from her home and Cannie Tong suggested escorting her. B changed her mind in the last minute and to everyone’s disappointment, she did not show up. Irene was most frustrated. 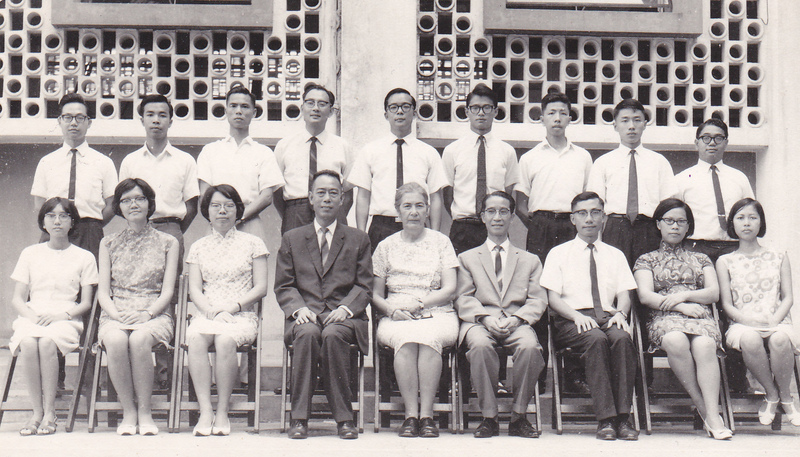 Ms Wong was a civil servant. She sometimes appeared on television concerning some health issues a few years ago. She is now retired. We searched for her name on the Internet and found one with the same name but we couldn’t identify whether she was our classmate. 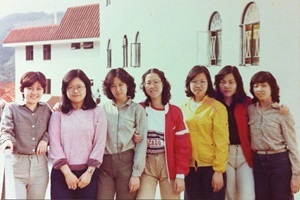 Can you recognize Ms Wong in the photo? She was the Superintendent of HC Association but retired on Oct 2010. Please advise if you think she is our classmate. The facial profile looks like her, although I would not be able to recognise her like a lot of our good classmates. It is not surprising that our friends like to dedicate their efforts to the charity organisations. The only chance I met her was in the street in HK while she was studying in the health/research field. She was interested in the water purifying system located at the Castle Peak Hospital. Simon offered his help to check this out although he was still in Melbourne. We gave Ms Wong’s previous employment phone number and email address to him. He sent an email to her colleague to confirm whether Ms Wong was our classmate. A few days later, we were disappointed that she wasn’t our classmate. Later on, we learnt that Ms Wong was living in Lam Tin. We tried to put a notice in Park’n Shop there hopefully she could read it. To our disappointment, there wasn’t any notice board in Park’n Shop where we could post our notice. Eventually, we obtained her email and home address which had yet to be verified. Adrian Hung sent her an email and also a letter to her home but to no avail. Our next step on these three ladies — we would be glad if you could give us some ideas. This morning, I recd a long distance call again. It was from Vancouver CS Shum. I feel great. After a few months’ try, CS replied eventually. He is married with a daughter who just got her second degree. He is retired already. He plans to visit to Hong Kong around Dec 11-Jan 13. Thanks to Irene for her best effort to search for CS Shum. She used an old name card and called CS’s former company. A lady said she would forward Irene’s message to him. Irene waited for three months and got no response from CS or that lady. Irene called the lady again and reported the case to us on the committee meeting on 21st Nov 2012. CS called Irene two days after the meeting. We were excited to reunite with CS. 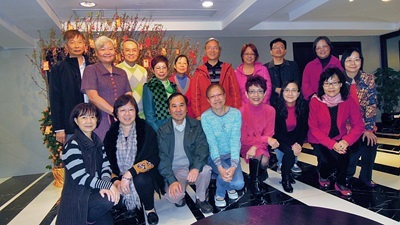 He made a special trip to Hong Kong to visit us and we had a welcome dinner with him on 16th Dec 2012. She then called TK for him to visit our website. TK called Irene Ko and connected with us. It is really wonderful and we are proud to have TK reunite with us. TK resides in New York and has just suffered from Hurricane Sandy. In fact, Sandy severely affected Long Island, NYC, and NJ, causing a lot of flooding and power failure. He survived the hurricane but was unable to get to work in downtown Manhattan for the entire week due to the impact. His house on Long Island is fine with the exception that a couple of roof shingles were blown off by the high winds. This hurricane caused a lot of problems to many people in the Tri State area (NY/NJ/CT) but was really nothing to him if he compared it with the 911 attack because he was working at the No. 2 tower on a high floor at that time. He migrated to the USA in late November 1980 and stayed with his family in Minneapolis for about 2 years. In April 1982, he left for New York and has been residing on Long Island since then. He is married with 1 son. TK was very eager to meet his old classmates but could not visit us immediately due to his heavy workload. We finally will visit us in May and we will have a welcome dinner for him on 15th May 2013. We formed a team to search for MO on 18th July 2012. Team members included William, Irene, Clara, Cannie and Adrian. Although Hang Hau changed tremendously in these forty years, we found the place easily using advanced technology. We knocked on the doors of some of the houses, however, none of them knew MO. We were lucky to meet the Chairlady of the Incorporated Owners of the Village. She told us that there was a resident with a similar name. We exchanged our phone numbers hoping that she could give us good news. We dropped notes and letters to some of the houses hoping MO would catch us up. 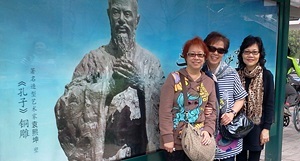 We drove to visit Hang Hau Village and had our late lunch at East Point City. We talked about our old days. William told us that a classmate of ours, S Chiang, married a pretty wife soon after his graduation. He worked very hard as a taxi driver in the day time and as a house caretaker at night. 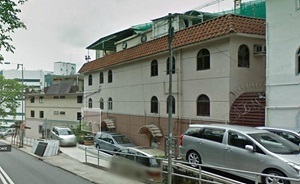 He bought a flat at Mei Foo Sun Chuen and enjoyed his romantic life with his beautiful wife. However, good days did not last long and life didn’t work out as smoothly as he planned. 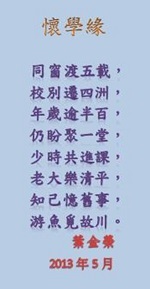 Chiang got kidney failure and died soon after. In the evening Clara received a call from the elder sister of MO. We were too sorry to hear that MO passed away in February, 2011 due to gas poisoning while taking a bath at his home at Huanggang, China. Clara wanted to pay tribute to MO at his graveyard with a few classmates. However we could not have access to the graveyard without valid document. Unfortunately we couldn’t contact his wife up to this moment. William So told us that WL Cheung is a Christian and is now a pastor at a Church in Wanchai. Clara took up the task to search for him as she is also a Christian. Clara’s friend told her that if WL is a pastor, his name can be easily found on Internet. Thanks God, she was able to find WL’s phone number. We then had Irene Ko to give him a call. We were glad to reunite with WL. Searching for WH Cheung was also easy. Angela Or told Adrian Hung that she is a primary school teacher. She used to teach at a school in Shatin but Angela could not contact her through her school phone number. Adrian then searched her name on Internet and found her name in a primary school in Kowloon. Adrian thought it would be more appropriate for a female classmate to give her a call. He met Cannie Tong on 23rd May 2012 in Wanchai before their committee meeting. Adrian invited Cannie to help him to search for MO Hui at Wanchai. Before that, Cannie gave a call to WH. These two ladies tried to recognize each other but they lost their names in memories. They exchanged their contacts. Cannie then invited WH to our gathering on 29th May. Adrian told the good news to Angela and asked her to invite WH to the gathering too. 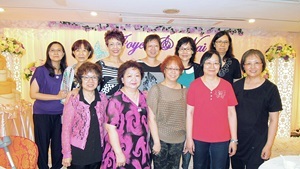 We had a reunion dinner on 29th May 2012. Eric Chu from Australia also attended the dinner. 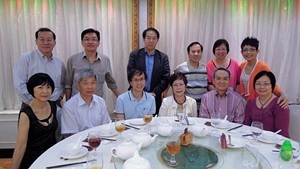 We were glad to have our teachers Mrs. Chan, Mr. & Mrs. Siu to come to the dinner too. We had a video conference with Robert Chu. Robert was in California and he had to get up pretty early to talk to us.